Campari might seem like an unusual suspect for a cigar spirit pairing, but it’s such a classic cocktail ingredient I’m determined to give it a try. Between Steve Zissou (played by Bill Murray) ordering up rounds on the rocks in the movie Life Aquatic, and Nick Naylor, the lead character in Thank You for Smoking, ordering up one vodka negroni after another in Christopher Buckley’s classic book on the nanny state, the drink is as cool as they come. 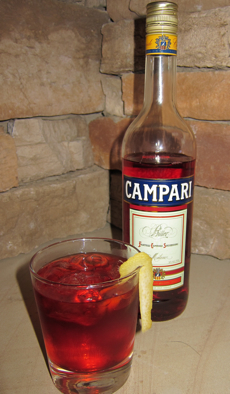 Campari, for those who don’t know, is an Italian aperitif made with a secret blend with plenty of bitters and a distinctive bright red color. It’s the main ingredient for Campari and soda, the Americano (Campari, sweet vermouth, and soda water), and the negroni (both of the gin and vodka variety). I decided to make a few negronis and see what cigars, if any, they pair well with. The ingredients for a negroni are simple enough: one part Campari, one part gin or vodka, and one part sweet vermouth served over ice with an orange twist. The result is surprisingly good. The bitter/sweet combination of the negroni (in both traditional and vodka varieties) goes surprisingly well with a variety of mild- and medium-bodied smokes. My extensive testing proved that mild smokes with creamy flavors, like the Cuban Crafters Medina 1959 and the Perdomo 10th Anniversary Champagne, proved an excellent pairing. Meanwhile, more medium-bodied smokes like the Tatuaje Reserva SW, Tatuaje P2, and the Don Pepin Blue Label also worked well. Ultimately, Campari cocktails are a surprisingly good complement for cigars. If you like Campari-based drinks (certainly not everyone does) you should go out of the box and make yourself a proper negroni and light up a fine cigar. No, it won’t replace traditional pairing staples like bourbon, scotch, or rum, but for something different, particularly as a pre-dinner smoke, order up a Campari cocktail. You just may find yourself pleasantly surprised. I love Campari! Not many do. Campari & Soda; Campari and OJ; Negronies, Americanos, all very good with cigars. An acquired taste! smoking a Don Kiki torpedo and drinking Campari & Soda with lime, now. The stuff is pretty expensive. Enjoy your reviews. I tried a Campari and soda last night with the Perdomo 10th Anniversary Champagne and found it to be a really nice pairing. I ordered the drink about halfway through the cigar—where I usually start to settle into most cigars—and thought the flavours worked nicely together. So, to my relatively inexperienced palate, this was a good suggestion.